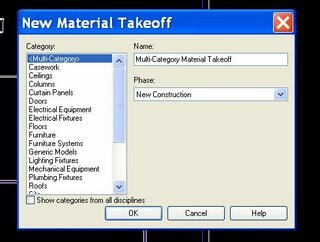 One of the larger features that was included with the Revit 9 release was material take off's. This feature allows us to easily schedule the type, quantity, etc. of materials that are used in our Revit designs. Needless to say, this is a huge part of green building. With this information we can also begin cost analysis & estimating directly from Revit. (A blog to come). 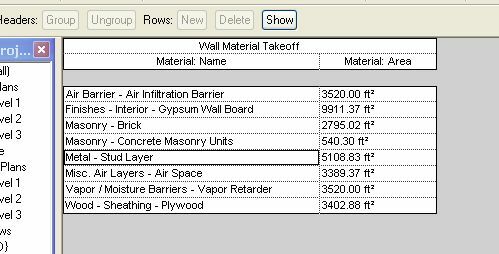 To begin this process simply browse to the menu View --> New --> Material Takeoff. 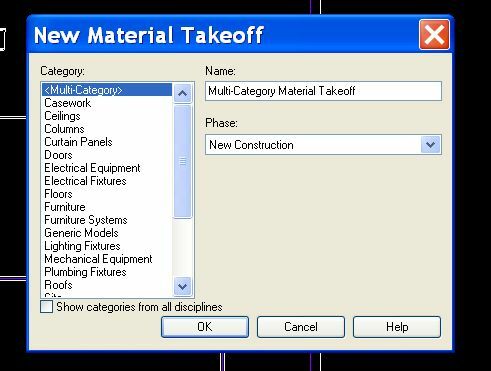 A dialog now appears where you can choose what you would like to create the material takeoff from. You can also assign a name to the takeoff, and as with other schedules assign a specific phase. You can then add your paramaters and appropirately set up your takeoff as you would any other schedule with an end result of all the material information you need. This feature is a huge step for the green designer for many reasons. Three major ones being: 1.) We can easily create common takeoffs & place them in our template & analyzie our material usage at very early stages in our design, thus allowing us to make prudent decisions on material usage. 2.) We can create a parameter to indicate a material to be recycled or new thus allowing us to evaluate recycled material percentages. 3.) We can input cost analaysis formulas into the schedules to analyzie the cost benefits of using alternative materials. With the fact that materials play such an important role in Green Building & Design, this feature is huge in the Green Design arena. More to come with this tool and some of the possibilities!